This past Sunday, I joined thousands of celebrants in Yeshiva University’s Lamport Auditorium for a most joyous occasion, as a record 230 of our young rabbinical students received their ordination, from our Rabbi Isaac Elchanan Theological Seminary. 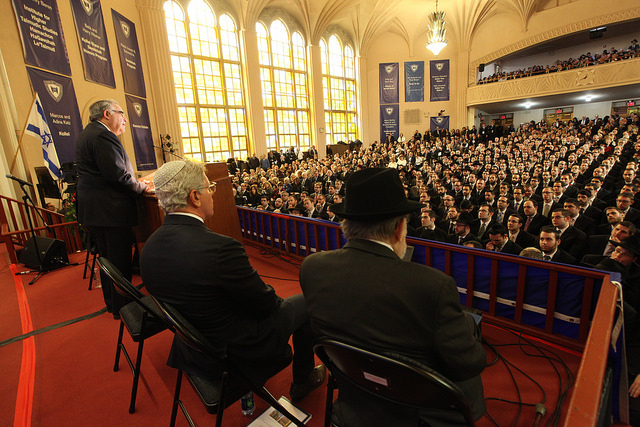 The atmosphere at this quadrennial Chag HaSemikhah event, attended by more than 3,000 people on our Wilf Campus, was simply electric; the potential energy latent in the collective capacity of these young men reverberated in the room, throughout our campus, and around our Jewish world. The moment was not merely memorable – it served as a dramatic demonstration of Jewish vibrancy and Torah vitality in our day, a ceremonial call to arms for the incoming leadership of our people. The Talmud in Tractate Berachot famously takes the word banayich,your children, and interprets it as bonayich, your builders, indicating that students of Torah build and preserve the Jewish people through their study. Two meanings: children and builders. Ostensibly, we must choose our interpretation. And yet our rabbinic tradition instructs that we may never fully abandon the literal meaning of a text. And so it would seem it is our responsibility to fulfill both of these roles, as children and as builders. The most basic interpretation of this dichotomy speaks to the magical duality that stands at the epicenter of Modern Orthodoxy, and defines our critical purpose in the world that will continue for generations to come: our responsibility to become inheritors – children, if you will – of a sacred textual tradition that informs a rich life of mitzvah, while partnering with God in advancing civilization. Our rabbis bear the sacred responsibility of serving as bothbanayich and bonayich, children and builders of the Jewish people, here in North America, in our beloved state of Israel, and throughout the world. As builders, they serve as the guardians of the halachic process in treading the line between Torah norms and modern sensibilities. We are blessed with a sacred legal system. It defines us. Jewish jurisprudence matters. We are a law-driven people. Non-negotiables exist. The openness of modern society challenges our commitment to process and precedent – but that’s simply not who we are at our core. It is that commitment to the halachic process that enables us to embrace tomorrow. We are builders in that we build upon – we do not buildanew. And yet we are not simply bonayich, but banayich; and we must fulfill that role by preserving the delicate innocence and joy of childhood. We must overcome the too prevalent penchant for cynicism, and seek the beauty and wonder in all people and things; we must safeguard the innocent notions of shemiras halashon; we must comport ourselves with childlike gentleness and model the idea of love for our fellow man; we must have difficult and contentious yet vital conversations with a child’s goodness, patience, tolerance, honesty and compassion, as respectful and loving children, with humility, reaching beyond, looking to make new friends. Banayich and bonayich. Two parts of the same person, two halves of a nuanced whole. Builders within a sacred system, children of understanding. These young men – with the professional training they have acquired, the intellectual rigor they possess, and the skills of leadership, counseling and community building they have gleaned – stand to work with all Jews in shaping the community of tomorrow. At the conclusion of the event, the assemblage poured out onto Amsterdam Avenue in an outburst of jubilant song and dance. The sight of it all caused my heart to be filled with hope for those youngmusmachim: hope that they will take on nuance, not run from it; hope that they will respect and revere the halachic system into which they enter, while responding to needs of our people with warmth, humility and understanding; hope that they will inspire all of us to build lives of meaning and of purpose, engaging with the wide world around us while informed by our sacred Torah. Richard M. Joel is the President and Bravmann Family University Professor at Yeshiva University. Follow him on Twitter @PresJoel. This op-ed originally appeared in The Jewish Press.